Saving the world again, Bubbles, Blossom and Buttercup have left school early to stop evil. Protected by their goggles and space suits, they zoom away from danger in a control room. 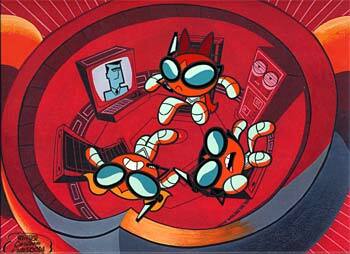 Created by Craig McCracken, The Powerpuff Girls were created when Professor Utonium accidently knocked over a glass of chemical X and the girls were born. With their super charged powers they challenge the forces of evil so justice will prevail.